Natural gas is benefiting both consumers and the environment. Breakthroughs in natural gas production have sparked an American energy renaissance, driving down domestic energy prices and emissions. Applying the principles of affordable and abundant clean energy, natural gas and hydraulic fracturing should serve as the model for future emission reductions. Applications to export natural gas must be processed in a reasonable amount of time. A single natural gas contract can take years to receive government approval. Contracts to export liquid natural gas are typically individually reviewed by the federal government. The review process adds unnecessary time and imposes extra costs on American exports. America is in the midst of an energy renaissance. Fracking has made America the world’s top producer of natural gas.1 Estimates show enough natural gas to power us through the end of the century.2 The windfall has reduced emissions and energy costs. 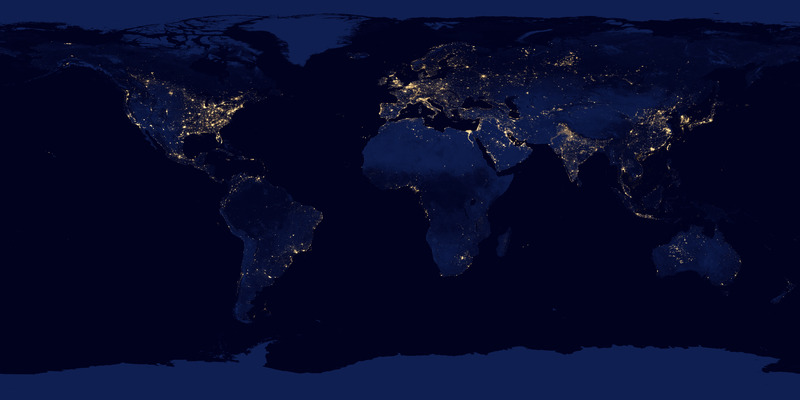 In many parts of the world, natural gas rates are more than twice those in the US. This creates a sizeable arbitrage opportunity for American exporters. 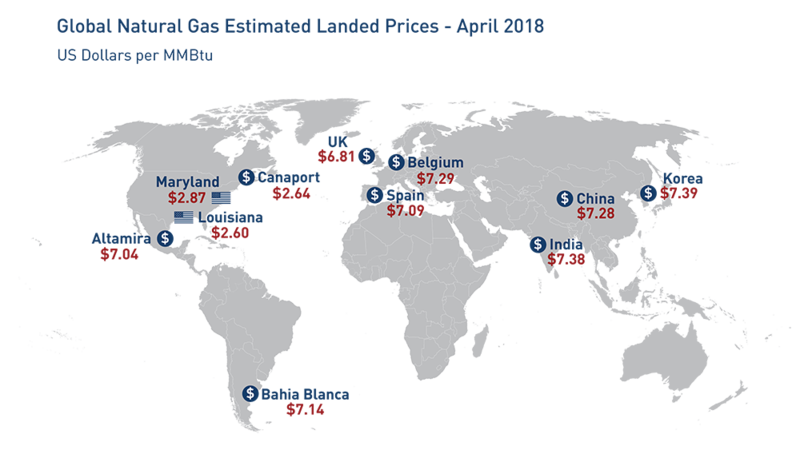 Unlike oil prices, natural gas prices vary widely across the world. Natural gas cannot be easily packed into barrels and onto barges. Instead, it is often landlocked because pipelines are the primary means of transportation. Shipping natural gas overseas is complicated: it must be condensed into liquid natural gas (LNG) at temperatures below -250ºF in highly specialized ships. These transportation constraints have created isolated natural gas markets around the world. Iran and Russia are the second and third largest producers of natural gas. If America doesn’t step up, it opens the door for our adversaries to exert a larger geopolitical influence. Bureaucracy is one barrier that is blocking America from satisfying the international appetite for natural gas. Liquid natural gas export agreements must often undergo tedious federal review. When a company attempts to export natural gas to a country without a natural gas free trade agreement, the Department of Energy reviews each case and determines if it is in the best interests of the United States. Government reviews of export applications are not standardized. According to the Government Accountability Office, “it is a case-by-case deliberation, where each application is considered separately from the others”.9 Standardizing the process and setting deadlines on reviews would facilitate U.S. natural gas exports and lower emissions in other countries by displacing higher emitting fuel sources. In 2019, the Department of Energy finalized a rule to fast-track small scale exports of natural gas. The changes reduce the regulatory burden of qualifying natural gas export contracts. To increase certainty for project developers, these changes could be formalized by Congress. Free trade agreements can be made with select countries to reduce barriers to U.S. natural gas exports. As of March 2019, only 18 countries had a natural gas free trade agreement with the United States.10 More countries should be added to facilitate natural gas exports. A single natural gas pipeline permit can take years to be approved by the federal government. Establishing regular and enforceable deadlines would reduce the regulatory burden and uncertainty on prospective pipeline developers. The federal government can establish pre-permitted corridors to expedite the environmental review process for future pipeline developers. Industry is deploying technologies to reduce incidental methane leakage from equipment, commonly referred to as ‘fugitive emissions’, such as from pipe connectors and valves. These strategies can be extremely effective climate solution because methane is a much more potent greenhouse gas than carbon dioxide. 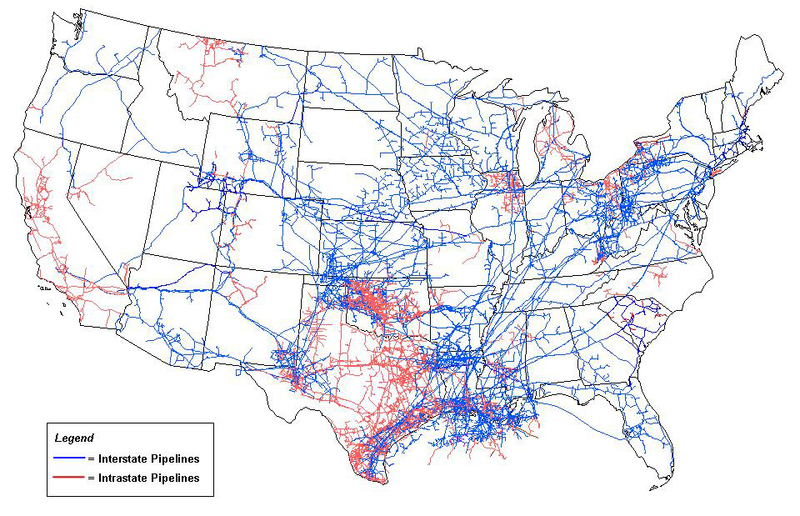 More than 300,000 miles of natural gas pipelines crisscross America, bringing energy to our homes and factories.11 Still, the immense network is proving insufficient in moving our vast shale gas reserves to where they’re needed. Nowhere is this more clear than North Dakota, where more than a third of the natural gas the state produced was wasted and released into the atmosphere. Why is natural gas wasted? Natural gas is often a byproduct of oil extraction, but capturing and shipping the gas can be expensive without the proper equipment. Unlike Texas and other traditional energy producing states, North Dakota lacked the pipelines and infrastructure to economically move natural gas from its fields to customers. North Dakota’s flared natural gas can be seen from NASA’s satellites in space, rivaling the brightness of America’s largest urban centers. A recent buildout of pipelines in North Dakota has helped cut gas waste to about 20%.14 Yet, significant progress can still be made: Texas wastes less than 1%. When the gas is wasted, economic value is lost. Locals forgo royalties, consumers miss out on lower energy bills and precious domestic energy reserves are wasted. Throwing our gas away makes even less sense because many parts of the country pay high prices.15 Sometimes there is not even enough supply. When natural gas demand exceeds supply in winter storms, blackouts may occur because home heating takes precedence over power generation. The federal permitting process can take years and be delayed by any number of government agencies or environmental groups. In 2005, Congress attempted to streamline the federal government’s review of interstate natural gas pipeline permits. The Federal Energy Regulatory Commission (FERC) was given the authority to set deadlines for other agencies to conduct their reviews. Despite new deadlines, delays continue to plague the process. In fact, a 2012 study found that delays actually increased by 20% since the bill’s passage.17 One reason is that agencies face little consequences for not complying with the deadlines. Codifying FERC’s deadlines or adding new enforcement mechanisms would facilitate the development of America’s natural gas reserves and improve certainty for prospective developers. Top energy producers have instituted initiatives to reduce methane emissions and flaring from their operations such as sharing industry best practices20, making direct investments in technology and field analysis21,22, and setting emission reduction goals.23 Since 1990, emissions have fallen by 14% while natural gas production increased by about 50%.24 More resources should be dedicated to developing technologies that can reduce the cost of methane management for smaller producers in rural communities and developing countries. States often lack the resources to identify untapped energy resources beneath their feet. The federal government can help research and scope the potential of these untapped sources. Advanced natural gas technologies will deliver economic benefits, improve energy security, and reduce emissions. Research at the Department of Energy’s national laboratories helped lay the groundwork for fracking. It’s a prime model of how basic government research can be commercialized by the private sector. The United States spent about $473 million on unconventional gas research between 1976 and 1992. That research proved critical in propelling the natural gas industry that adds over $100 billion of benefits to consumers each year.25,26 As previous research fueled our current energy abundance, innovation today will support America’s continued energy security. The National Energy Technology Laboratory (NETL) is the only U.S. national laboratory dedicated to fossil energy research. Oil drilling is an inefficient process. Conventional methods can leave behind 50% to 70% of oil in the ground. To tap more of the leftovers, oil companies use a set of techniques called “enhanced oil recovery”. Declining oil fields can be rejuvenated by injecting carbon dioxide beneath the ground to lubricate and extract this hard to reach oil. The oil industry (such as Shell, Chevron and Occidental Petroleum) have been independently researching and using enhanced oil recovery for more than four decades without issue. Yet, more research is needed to scope and define the potential of these opportunities in the United States. Advanced technologies in the development pipeline can improve the way electricity is made. ExxonMobil is invested in one technology that does not burn any natural gas. Instead of combustion, it uses a chemical process similar to a battery. Another remarkable feature of the technology is that it can purify a fossil power plant’s emissions.28 The processed emissions can then be used to stimulate oil extraction. NET Power, a 50MW demonstration plant near Houston, is using the “Allam Cycle,” a revolutionary technology that could capture all carbon dioxide from natural gas generation. The plant achieved “first fire” in the spring of 2018 and may be the catalyst for large-scale carbon capture commercialization for new natural gas facilities. 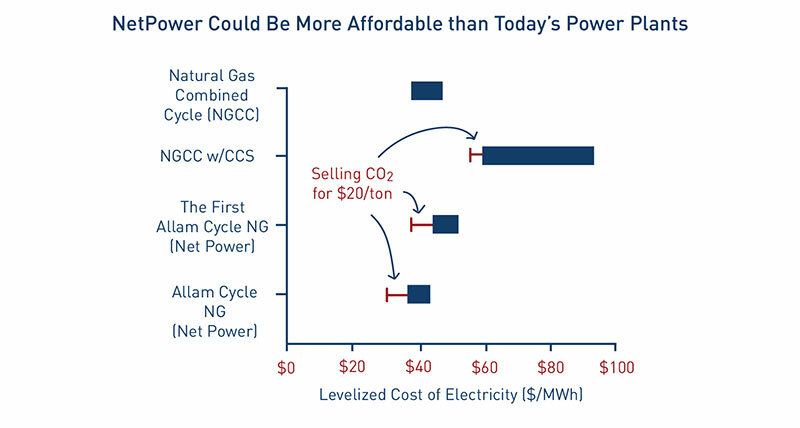 If successful, it will be a lower-cost and cleaner approach to making electricity with natural gas. A few of the innovations: 1) natural gas is burned in pure oxygen instead of air, 2) it produces no pollutants, and 3) uses supercritical carbon dioxide rather than water to move the turbine. Federal energy research programs are paving the way for these and many other types of concepts. Over a dozen of America’s largest energy companies, including Southern Company and Duke Energy, have banded together to underscore the importance of researching more dynamic and efficient technologies. Doing so will maintain America’s competitive advantage in energy through the 21st century.